And so I steel myself for yet another answer to Makoto Shinkai’s long string of spatially troubled relationships. Indeed, your name. appears to be, if anything, an answer to that same question regarding the value of relationships — of bonds and connections — in a spatially disconnected world. And it does so by opting for a more fantastical depiction of love that involves people switching bodies, traversing through different time periods, and defying fate. If you’re thinking that sounds a bit ambitious at this point, then you’re not alone. But regardless of the devices used this time around, was Shinkai’s answer to the question in your name. a satisfying one? Let’s find out. The story revolves around a certain Taki Tachibana and Mitsuha Miyamizu, who one day mysteriously end up switching bodies at random. For the high school Tokyoite Taki, that meant living for a day in the body of Mitsuha, daughter of the mayor of the small town of Itomori in central Japan and heiress to a tradition of shrine maidens. The two eventually find ways to cope with their strange predicament using the technology available to them, including diary entries in each of their smart phones and — when they really need to get their frustration across — written messages in the form of body graffiti. But eventually, Taki stops experiencing the body-switching phenomena, and so returns to his normal life. Still, a lingering attachment to his experiences of living in Itomori pushes him to search for his supernatural pen pal, if only to discover the harrowing truth behind the entire experience. The first scene of the movie presents to us an awfully familiar piece of visual imagery: a meteorite streaking vertically across a setting sun as it careens towards the earth below. 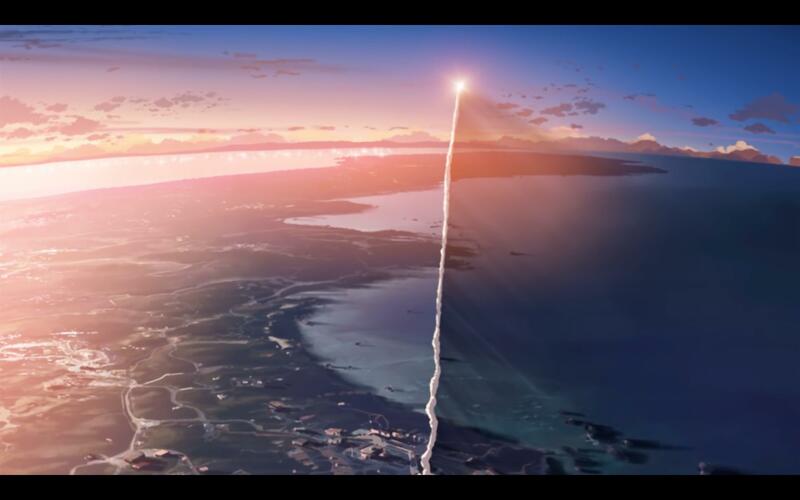 Upon seeing it, a thought comes to mind: “Doesn’t that look just like the scene from 5 cm per second?” As early as the start of the film, Makoto Shinkai appears to be making a very clear statement regarding the nature of this film. If 5cm per second presented us with a space shuttle’s contrail streaming across the sky from the earth to the heavens, your name. presents us with a piece of celestial rock that falls in the opposite direction, as if challenging the very nature of the former. It’s a clear statement that this movie is an anti-thesis to whatever came before it. To me, at least, it was a sign that I might finally get a satisfying answer to the questions that have been bugging me ever since I started watching Makoto Shinkai films. But what follows is an anime-esque opening sequence that shows snippets of events from the main film, as if it were some kind of promotional teaser. To be honest, I felt this digression in presentation was a little inappropriate given the established tone, and the result was that it came off as a little cheap. Now I’m pretty sure some anime-to-movie adaptations have employed something similar in their theatrical premiers, but really none of this really adds to the narrative. And to make things worse, the use of musical interludes meant trading off valuable character development between Taki and Mitsuha living in each other’s bodies with what looked like a montage of shots in a music video. For a movie that was only roughly 100 minutes long, I would have expected a bit more focus on the more critical premises of the story; namely, its concept of switching bodies. Because that missing critical element made for an oddly paced first “third”. And this is probably the first time I’ll actually say something like “first third” for a movie because the plot structure seemed to be that apparent. In fact Makoto Shinkai has always used a sort of 3-part formula for devising the movement of his characters, allowing the temporal separation of each sequence to serve as the spatial separation needed for his themes on distance in love. But this is precisely why Shinkai’s strength has always been in shorts. The same style of using musical interstitials or abrupt sequence shifts meant for some strange interactions between characters, like when I wondered how Tsubasa and Okudera became friends, given that the former was Taki’s classmate and the latter was Taki’s senior co-worker at a part-time job. Even the more obvious part regarding how Taki fell in love with Mitsuha felt divorced from what the music video segment was portraying. In fact, for majority of that interlude, we saw the two bickering with one another to the point that they consistently vandalize each other’s bodies. But how this connects to them eventually having feelings for one another feels abridged when Taki feels uneasy on his date with Okudera despite him having had feelings for her. And then the film proceeds to showcase Mitsuha’s reservations in setting the two up (she did it using her “female charms” whilst in Taki’s body), if only to imply her own burbling affections for Taki. But the story moves on despite my reservations in its presentation. For the second “third” of the film, focus is re-directed towards the underlying themes of human connectedness; more overtly in how it uses strings to represent how everything is intertwined in the fabric of existence. But in typical Makoto Shinkai fashion, the use of dichotomy serves as this film’s version of distance, utilizing themes such as male vs. female, modernity vs. tradition, urban vs. rural, and young vs. old, to depict a world that separates us from one another. It’s quite a lot for the film to chew on, and indeed many of these themes aren’t satisfactorily addressed come the end of the showing. But there’s a certain charm to the approach when looked at from Shinkai’s previous outlook on the subject matter. In your name. at least, Shinkai’s characters embrace this underlying thread of connectedness fully, and are drawn to it in spite of whatever threats of distance are put up against them. If Takaki from 5cm per second succumbed to the inadequacy of bringing himself to send messages to a distant love, then Taki in your name. continues a blind search for a person and place that he can hardly even describe. This brazen optimism in your name. is oddly refreshing coming from a Makoto Shinkai work. But as is with Shinkai’s worlds, it conspires in ways that often feel unfair to its protagonists, going so far as turning their own memories against them. And so the final “third” of the movie takes us on a fantastical ride through borderline sci-fi themes to show us how Taki and Mitsuha’s innate desire to connect with one another can thwart all efforts of the world to draw them apart — that not even time, distance, or even death can make either of them lose faith in the hope that they can be reunited with one another. I honestly came in to this movie with a somewhat cynical mindset, feeling that sappy love stories like these had little to tell about the dynamic nature of human relationships, and that it seemed like a thrill ride just to chuck in some feels for a darling audience. But in the end, I realized that it had a more satisfying answer to the problems brought about by works like 5cm per second and the Garden of Words. I believe we really DO need sappy love stories like this now and then that show us how love can triumph amidst an oppressive world seeking to divide us more than bring us together. That acting only to fail is preferable to failing out of inaction. That in a world so brought up by cynicism, it is a joy to discover that we are so intimately linked with one another in ways that can transcend the brokenness of reality. And Shinkai’s answer to the question I talked about previously appears in the last scenes of the film, mirroring somewhat the final scenes from 5cm per second and the Garden of Words (the former uses a scene where its couples cross paths, while the latter takes place on a stairwell). With some jabs that make you fear for the worst (I won’t spoil it, but the word “wedding” is brought up), our two protagonists end up as adults who have forgotten about one another. But for much of their lives, they live with a void — a longing for something inexplicable — and their monologues echo the sentiments of a disillusioned Takaki from 5cm per second. But at one point, they see each other from the windows of separate trains. Even though they finally realized who the other was, they are pulled apart by the forces of the world as the trains send them down different paths. But Shinkai makes them run out of the station in a blind race for them to find one another. It’s sappy. It’s corny. It’s very impractical. But that’s just the way humans are. We’re sappy. We’re corny. We do very impractical and sometimes illogical things in search of our selves or the things that make us complete. But when we do end up standing face to face with it, we find ourselves frozen in place. The words get stuck in our throat. The world brings us together, but we can’t bring ourselves to say what needs to be said. The moment passes and everything is lost. And then we console ourselves with our own inadequacy to justify our inaction, just as how Sumida never confessed her feelings to Takaki in 5cm per second. Shinkai is not under the illusion that people are suckers for drama, good feels, and good endings. Instead, he’s presenting this scene as a challenge — directly to the audience and directly to the ending of 5cm per second and the Garden of Words. When the moment comes when you need to do what needs to be done — or say what needs to be said — can you do it? Will you do it? The film spoils us with a mushy platonic, but beneath its puppy dog surface is a valid counterpoint to the depressive themes ushered in by its predecessors. And in the end, it was very rewarding to actually see the two turn to face one another and overcome the time and distance that stood before Takaki and Akari in 5cm per second, and Takao and Yukari in the Garden of Words. The answer is clear: love can overcome any distance. Despite awkward pacing and at times inappropriate use of music as an interstitial, your name. lives up to its hype in ways that go beyond the populist belief of a story that’s just in it for the feels. your name. is a clear answer from director Makoto Shinkai regarding the power of love to overcome time and space, but is also a challenge for the cynics and the disheartened to act towards that end. We can mull over our own self-righteousness regarding the platonic, but Makoto Shinkai presents us with a different breed of character — characters that actually take charge in situations many would bow out of due to fear and inaction. It’s a mindset that has plagued his characters before, but this time around, these characters invite us to leave our shells of cynicism; we are invited to embrace the fantastic search for the ideal in an oppressive world. Because it’s in sharing in the victory of these characters that we share a similar victory over the cynic within us all. your name. is a wonderful story that celebrates the beauty of human connectedness; a triumph of celestial and temporal proportions. I haven’t watched this movie, but I loved so many little details in this. The most memorable parts of the review to me were the image of the celestial rock at the beginning, and how you relate it to all of humanity at the end. Definitely needed considering things lately. Thank you. I honestly felt the movie was a bit odd after I finished it, and it took me a while to wrap my head around the themes. It was only after re-watching 5cm per second and the Garden of Words did I realize how this movie was actually answering back at these two older works. That’s not the best way to make a movie, I know, but I wanted to bring those connections to light in this review. Because in the end, it really was such a great film. I was wondering if you had watched the other two movies to write this; 5 cm per s came out quite a whileago and I barely recall it except for the image of cherry blossoms and two people. I think there’s a lot of good precedence, especially with these well-known movie guys, to compare how they approached their works, and it did make sense here. Thanks for all the hard work, and for including enough details so for viewers who hadn’t seen the movies / saw them a long time ago to follow along :D! @alane – [redacted] – I read that comment wrong, lol. You can re-watch the full 5cm per second on YouTube, I think. The Garden of Words isn’t available for public viewing over YouTube, so you’ll have to purchase the DVD. I just borrowed my friend’s copy, but I’m thinking about getting it myself.